The maker of hit film Bend It Like Beckham, Gurinder Chadha, is returning to her primary school in west London to direct the Nativity play. Chadha, whose other big screen credits include Bride and Prejudice, will lead a group of children from Clifton Primary School in Southall. A behind-the-scenes film of the production will be screened on Sky Movies on Christmas Eve. 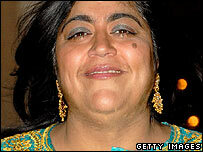 Chadha said she was "very touched" to have been asked to take part. "This is the first time that I have gone back to my old school and am thrilled to be working with the children," added the film-maker. Some of the pupils will make short films in Nativity costume, which will be used to introduce some of the station's Christmas offerings. The entire Nativity play, to be staged in the school's assembly hall, will be made available to watch on the Sky Movies website. The Nativity film is expected to become an annual event in which a different director will be invited to take part. Chadha, who attended Clifton Primary School in the 1960s, was lined up to direct the big screen remake of soap opera Dallas, but departed from the project earlier this year. She was made an OBE in 2006.